In the morning we had an Ashiatsu massage at Affinity Massage. The owner Mary Claire, was amazing and I would recommend anyone to go to her. Ashiatsu message is a massage performed totally with her feet!...but you would never know... it was honestly the best massage I have ever had. We got this deal through Groupon which you can sign up for online and they will send you a really good coupon everyday (that massage was something like 61% off) crazy! After that I got my haircut at Tanya's in Hyde Park Square. Apparantly when you buy a house people LOVE to send you coupons for free stuff...including a packet of really great coupons from all kinds of local businesses....and one of them was a free cut and style from this nice upscale salon...sounds good to me! Arm and hand massage while you wash my hair? um..yes please! Afterwards was a pre-dinner treat at one of my favorite places in Cincinnati, Yagoot! Being a "yagroopie" (aka being on yagoot's mailing list) usually gets you some perks...like getting to try a new flavor for free! The new flavor (banana) was totally delish. Tangy like the original with a slight banana flavor....Rob got granola and I got the special V-day topping...shaved strawberry and chocolate crunchies....both were very good topping choices. Finally it was time for dinner and we had a $100 gift card to Mortons (cashed in a few credit card points)....Mortons is running a special right now that is a total steal. of course with a bottle of wine, tip and a couple of cups of coffee, we paid above the $99, but still..what a great deal! And a table overlooking lit up fountain square at night.. I've been dying to eat at Suzie Wong's and last night we finally got around to going. Also, any regular readers of this blog knows how I feel about BYOBs and this is one (for now)...word around the street is that they have applied for their liquor license...but there is still some time to enjoy the current byo status :) They do charge a $5 corkage fee, though. Suzie Wong's is located where Seny used to be on Madison Road. It's a neat location.. a small(ish) place with big windows and dark red walls...very cozy. The wait staff is friendly & knowledgeable and I really like their wine glasses....which sounds silly, but it's kind of a big deal to me. I hate when you go to restaurants and they have awful wine glasses... but I digress...on to the food! We ordered Crab Rangoon for an appetizer...maybe a little boring, but I don't care... I'm slightly obsessed. It was really really good. Hot, creamy and you could actually taste the crab, unlike a lot of places. Very good. He poked the fried egg and the yolk mixed in with the rest of the food....you could add as much or as little of the spicy red soy bean paste as you wanted depending on how spicy you want it. He couldnt stop talking about how tender the beef was... it was a really flavorful dish...and who doesnt love somethin served in a "steaming hot clay pot"
Chicken breast, sweet onion, green and red peppers, seasonal vegetables sauteed in a Malaysian yellow curry served in a country clay pot. I asked our waitress if she had a suggestion and this came out of her mouth before I even finished asking the question.... sounded delicious to me too so I went for it. I've mentioned before that I thought I hated coconute milk until about a month ago at Rob's Birthday Dinner at Tellers when I discovered maybe I don't hate it...since then we have made a homemade red curry with (low fat) coconut milk, and now I ordered this...which was seriously delicious. So apparantly I actually love coconut milk...who knew? Anyway...this was just delicious...the complexity of the curry was something I hadn't tasted before. It was spicy and rich and I loved the way the brown rice soaked up the sauce after stirring it in. The chicken was also cooked perfectly...and again..who doesn't love a unique presentation. Suzie Wong's...we certainly hope you're here to stay...we will definitely be back. Fix the equipment you already have, or at the very least put a sign on the broken ones. I got set up on 3 broken elipticals in a row last night before having to stalk girls by looking at their remaining time and just standing behind them waiting for them to finish. Maybe some of the enormous staff of sales people you have who are constantly selling additional membership to an already over capacity gym, could learn how to fix broken equipment instead.....and take a little break from overselling the place. If you know the machine next to you is broken and you see someone get on it, mention the fact that it's broken before watching them set up their headphones and ipod, find a good station on the tv, etc... a quick "I think that one's broken" will suffice. ok. rant over... for now.. They brought the 8 of us to what I considered to be one of the best tables in the house. We were lucky enough to get a February day that was perfect enough to sit outside. Now onto the food...oooh the delicious food. This was so good... a little bitter from the brussel sprouts, rich from the cheese, light from the vinaigrette...seriously. so.good. It was the raw fish selection of the day...which was tuna...on a huge salt brick... the size of the salt block is a little crazy, but I had a little bite of the fish.. yumyumyumyum....the longer you let it sit on the block, the saltier it got. All my life I have done something for lent... when I was in grade school it was something like be nicer to my sister or pick up my toys. In high school it was usually giving up soda or junk food. More recently I've tried to do something positive rather than give something up, like try to volunteer or do nice things for others... this year...it is going to be 40 days of exercise. I feel like this is something challenging and also really positive. Rob, my friend/co-worker Nancy and I are taking on this challenge.... and there's no going back once it's written on the blog!! We must work out every single day for 30 minutes minimum for the 40 days of lent. Today is Day 1 of the 40 day Challenge. 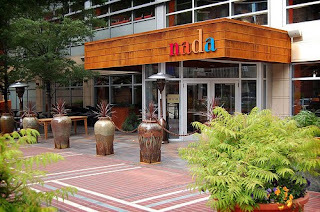 In an earlier post I promised a restaurant review on Nada... so here goes! For dinner Rob had the mahi mahi tacos. Fried baja style with guacamole and pico de gallo. He loved the batter on the fish and the creamy guacamole. In conclusion, it was a little pricey, in my opinion, for tacos... next time I think I would go for the drinks and a few appetizers with a group rather than the $16 tacos. But it's definitely a place I'm looking forward to going back to. 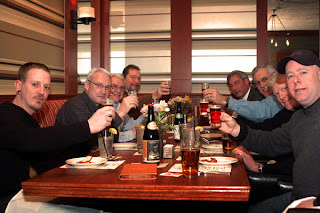 I took Rob to a Beer Dinner at Teller's for his birthday last week. It couldn't have been more perfect on both the timing and location. It was held ON his actual birthday and at a restaurant right down the street. yay! Let me first tell you a little first about the concept of the dinner. 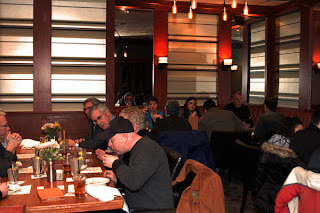 Tellers has beer dinners about once a month. A beer distributor comes and talks about the beer and Tellers makes special dishes to match each beer. I have to say, I've never really had beer paired with food before and was wondering how it would go....it was really really good, and educational and fun! 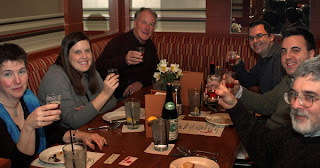 The beer for this tasting was dogfish head which is a small microbrewery in Delaware (look.... I'm in...Delaware...).. with some seriously tasty beer. When we got there, there were 3 large tables set up with name tags on them. This was one of the coolest parts of the dinner, we sat at a table in the middle of an older couple and on the other side a Dad with his son who was our age. We chatted with both duos easily all night and I think that really added to the fun. It also, however, distracted from my picture taking of all the courses... I felt silly taking pics with them at the table... not even sure why... I should have just explained the food blog...but oh well. It was a five course meal with a small tasting glass of beer with every course. Let's just go through the courses....sorry again for the lack of pictures! The cheddar was sharp, the crostini was crunchy and it was simple and exactly as you wanted it to be....and the IPA paired with it was a perfect starter. Red Curried Coconut soup paired with Midas Touch. I do not like coconut...I was not looking forward to this dish...it was the best dish of the whole night, in my opinion.... it was spicy and creamy and if it was an actual dish on their regular menu I would want it on every cold day of the winter. I need to figure out how to make this recipe at home...so much for hating coconut! Finally for dessert we had a chocolate pana cotta with candied orange paired with a chicory stout... again, the beer was a little dark for me, but Rob happily drank his and what was left of mine....and the pana cotta was absolutely.Perfect. But speaking of snowballs... I'm all snowed in and ready to write some updates..
Chicken covered with carmelized onion and apple and a little bit of mozzarella cheese...with a little bit of barley and broccoli on the side... Delicious! !